With the most turbulent season of his career behind him and an uncertain summer lurking ahead, LeBron James found a sense of normalcy by doing what he does every June: Booking a trip to the Finals. 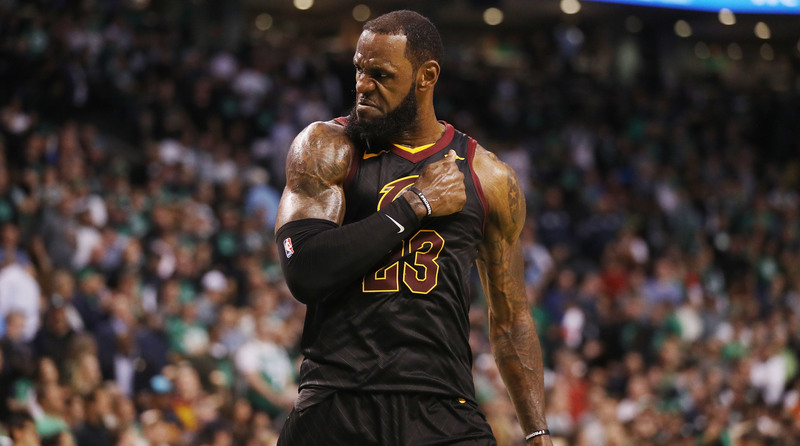 Entombed in ice, LeBron James looked up from his chair in the visiting locker room at TD Garden late Sunday night, legs numb and lids heavy. "I could fall asleep," he said, "right here." He was drained from 48 minutes, from six weeks, from eight years, depending on how you look at it. He called home via FaceTime and checked in with the kids, listening to their giddy voices through his headphones. The last time he fell short of the NBA Finals, LeBron Jr. was five and Bryce Maximus was two. Now, Bronny is mulling college scholarships, Bryce is approaching middle school and they have a sister named Zhuri. The James children, along with the rest of a generation, can scarcely remember a time when their father was not in the Finals. He does not always win, of course, but he always shows: in Miami and Cleveland, Dallas and San Antonio, Oakland and Oakland again, his presence as much a June tradition as graduation ceremonies and summer kickoffs. This was the year to finally dismiss him by Memorial Day. Kyrie Irving was traded. Kevin Love was concussed. In February, about half the roster was overhauled, though not necessarily improved. James was due an extended offseason. What transpired was the opposite. Eleven times in the playoff gantlet he logged more than 40 minutes. Seven times he scored more than 40 points. Three times he put up triple doubles. Twice he sank buzzer beaters, including that preposterous across-his-body runner against Toronto, which has become a new hallmark. 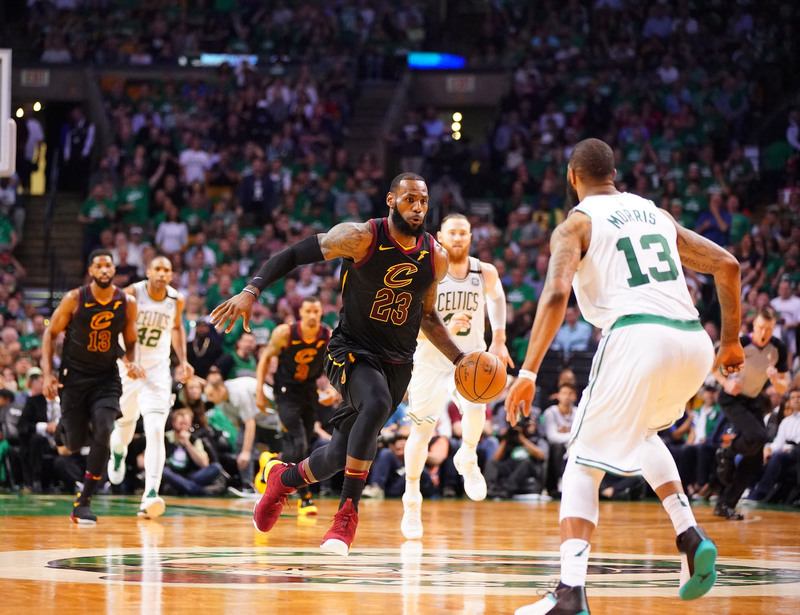 In Game 6 of the Eastern Conference finals against Boston, James had 46 points in 46 minutes, and by the second quarter of Game 7 he looked spent. He stumbled on drives. He slacked on D. He grabbed his shorts and steadied his breaths. 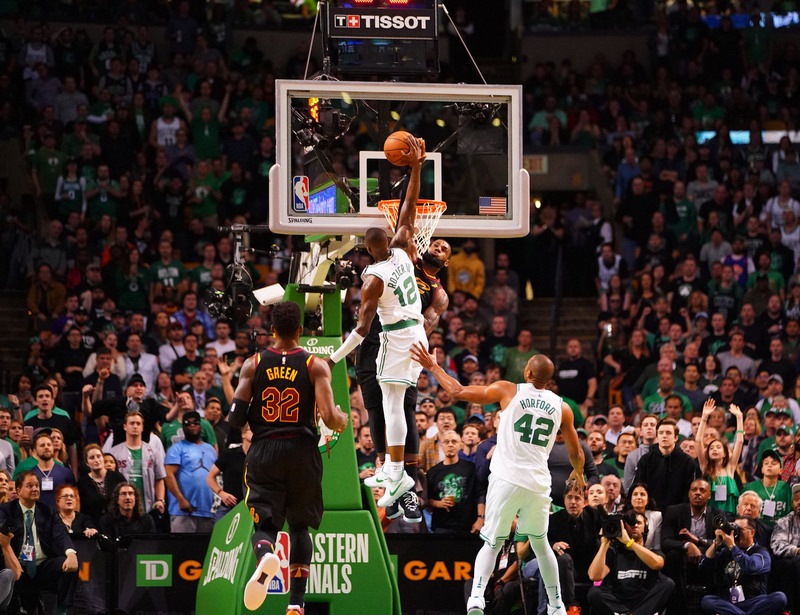 At 33, James recognizes how and when to dispense limited fuel, preserving precious reserves for defining moments: the block on Terry Rozier, the horse-collar from Marcus Morris, the full-court outlet to George Hill, snatched out of the Love playbook. James's friends and family, who typically view conference crowns as party favors, celebrated the silver ball with uncharacteristic enthusiasm. This was not the Pacers in 2014 or the Hawks in '15 or the Raptors in '16. The Celtics employed arguably five of the six best players on the court, and still that wasn't enough. Boston scored just 79 points against the 29th-rated defense in the league. So Celtics rookie Jayson Tatum, 20, will watch LeBron James in the Finals, which he's done every year since he was 13. James has lorded over the East for the equivalent of two presidential terms. Someday, presumably, it will be Tatum's turn or Joel Embiid's. But for now, James is back in his customary place, adding to a Finals scrapbook that swells every June. There are good memories and galling ones, with no blank pages in between. JUNE 2011: "Does it bother you that so many people are happy to see you fail?" James sat atop a podium at AmericanAirlines Arena in Miami, 11 months after taking his talents south, and forced an insincere smile. "All the people rooting for me to fail have to wake up and have the same life they had when they woke up today," James replied. "And I'm going to continue to live the way I want to live." Then he rode back to his house in Coconut Grove and didn't emerge for two weeks, listening to Barry White on his iPod dock and watching the Cooking Channel. "It was like, 'So we're going to make a turkey burger gourmet today, and LeBron James failed!'" he cracked. This was not how he wanted to live. He grew a beard so thick he reminded himself of Tom Hanks in Castaway. The Mavericks had toppled the Heat with a sagging defense that forced James into midrange jumpers, and when he studied the tapes, he saw himself hesitating. "It's the pressure of not wanting to let your teammates down," he said. "I feel awful in that locker room because I could have done something more." JUNE 2012: "If someone came to you right now and told you, 'If you don't win tonight, you won't see your family again,' how would you play?" James asked the Heat before Game 5 against the Thunder. "Approach this game like your family is in danger. How bad do you want to see your family again?" He captured his first title with a team that revolutionized NBA offense, installing Chris Bosh as a small-ball center who could shoot from outside, opening newfound driving lanes for James. After Miami throttled Oklahoma City, James found 23-year-old Kevin Durant. "I told him he's unbelievable," James said. "I told him he shouldn't feel any regrets. I hope it's us and them every year." Two days later James sat on the terrace at the Ritz Carlton in Coconut Grove with Bronny and Bryce. "It just finally hit me," he texted childhood friend and business manager Maverick Carter that morning. "I'm a champion." As James scolded the boys for dipping chicken fingers in maple syrup, a crowd formed inside the Ritz for a Jewish wedding. He posed with the couple for a picture. They were all getting rings. JUNE 2013: Do everything to help the team, no matter what the cost. Heat coach Erik Spoelstra drew up a contract for every player, and James used the formal version of his two autographs to sign his pact. Through the playoffs he dropped 10 pounds due to workload and stress, reporting a nightmare about confetti falling on Tim Duncan's head instead of his. The Spurs deployed a similar defense as the Mavericks, with Kawhi Leonard playing off James and two helpers waiting behind. "They're begging him to take that 16-footer," a Miami coach said. James queued up video of himself draining midrange jumpers the previous summer. "Why would you abandon this thing that's helped make you what you are," James pondered. "Stop second-guessing yourself." With 33 seconds remaining in Game 7 and the Heat ahead by two, James bounded around a screen from Mario Chalmers and buried a 19-footer over Leonard from the left elbow. "It was an M.J. moment," James said, the 1998 Finals fresh on his mind, having screened the replay in his San Antonio hotel room. "It was an L.J. moment." JUNE 2014: "This is going to be your league in a little while." That's what Duncan told James after his first Finals in '07, when the Spurs swept the Cavs. Duncan was right, but before James could reel off a string of titles the way Jordan did, San Antonio found a new way to halt him. Leonard was again the primary defender on James, only he took a much more aggressive tack this time. Leonard crowded James, limiting his headlong drives, and the Spurs switched pick-and-rolls to stay in front of him. Bothered by Leonard's length and activity, James cracked the 30-point threshold only twice in five games. As the Spurs rejoiced, the Heat exhaled. After three years of high drama an era was ending. Less than a month later, James returned to Cleveland. "Painful," he said of the Finals defeats. "But then some days go by, and you refocus, and you start to think, Maybe I can get there again." JUNE 2015: "How 'bout that confetti tonight?" James grumbled on the night the Cavaliers won the Eastern Conference. He maintains that confetti should only fall after the Finals. "Dude," then general manager David Griffin replied, "we won the East!" Love was injured, and after one game at Oracle Arena, so was Irving. James was a compelling solo act (the first player to lead both Finals participants in points, rebounds and assists) but ultimately an unsuccessful one. After Game 6 he sat alone at his corner locker for 45 minutes in an undershirt and shorts, towel over his shoulders. When he finally left Quicken Loans Arena, he walked down a hallway polluted by champagne, past a room where the Warriors posed with the Larry O'Brien Trophy. "LeBron tells everyone he's gotten to the point where you give it your best effort, and if you don't win, it is what it is," Griffin said. "I think that's bulls---. I think he was consumed by that trophy in a way that was probably not healthy, and when he didn't get it, I don't think he was the same person for a while." JUNE 2016: "There's a light still shining," James told his wife after the Cavaliers fell behind 3–1, and he texted the team from his phone with the Larry O'Brien Trophy screensaver. "We have to go to Golden State for Game 5 and we have to come home anyway," he wrote. "So why not come home and play a Game 6?" James scored 41 in each of those games, and as he left the Q for one last trip west, he asked an associate, "Can you imagine if we pull this off?" At 3 a.m. after Game 7, while the Cavs sprayed champagne at the Wynn hotel in Las Vegas, James sat over a Margherita pizza in a lobby restaurant and tried to deconstruct history: his block on Andre Iguodala, Love's stop on Steph Curry, Irving's three. That's what everybody saw. What they didn't see was James on the bench, when coach Tyronn Lue called the play for Irving, telling his excitable teammates, "Chill the f--- out, and let's get a bucket." They did both. "This was bigger for me than the first and the second," James said of his previous titles, "because of everything it represents. This is what I dreamed." JUNE 2017: "LeBron was larger than life," Durant said. "I was just taller." Five years had passed since James embraced Durant in Miami and finally they readied for a rematch, Curry in place of Russell Westbrook and Klay Thompson instead of James Harden. Before the series, Durant reviewed six years of matchups with James, and in the last minute of Game 3, he unleashed the dagger over James's outstretched left arm. Durant and Curry had lost a championship apiece to James, but together they leveled him in five games, and Irving asked out of Cleveland soon after. Which brings James to June 2018, the end of the most trying season of his career, filled with injury and tragedy, illness and upheaval. Love missed two months with a broken hand. Lue missed two weeks for a leave of absence. Kyle Korver buried his brother. Six players were shipped out at the trading deadline, and four were brought in. Results of the deals were mixed, but the Cavaliers are alive, thanks to the one guy they were able to keep. James will be an unrestricted free agent this summer, and every basketball city with a few billboards is begging for his attention. That will be the story of July. But this is June, and wherever he winds up, the Finals are always home.